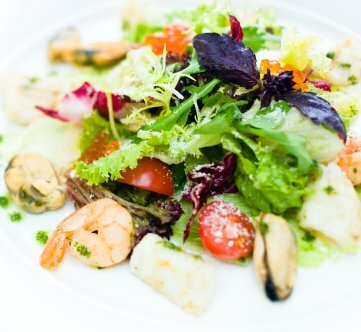 This seafood salad is quick and easy to make. It is delicious and at the same time filling. Using your food to help lower your high blood pressure levels could not be made any easier. Most people eat salads throughout the year but in the fall and winter months we should be focusing on more warming and earthy foods. I do eat salads all year but mostly in the spring and summer months. Spring is the season for growing baby greens, lettuce greens and to find fresh baskets of greens from the farmers market. This lip smacking and satisfying salad can be part of your recipes for high blood pressure. Bye-bye bowls of boring salad. Most people resign themselves to eating iceberg lettuce. Knowing that after eating the last tomato they will still be hungry. But not this salad that is colorful, features a variety of tastes and also pairs nicely with grilled chicken. It is nutritional and is filled with heart healthy ingredients like romaine lettuce, tomatoes, onions, parsley, to name a few. These dark leafy greens are rich in calcium, chlorophyll, iron and vitamins C and E. Leafy greens lift our moods, and heal our organs that's damage from the stress of high blood pressure. Mix crab-meat, shrimp, onion and bell pepper in a bowl and set aside. Combine the mayonnaise with the relish, mustard power and hot sauce in a small bowl, blend and then add lemon juice and salt to taste. Pour the mayonnaise mixture over the crab-meat mixture, gently stirring to combine. Then put an equal portion of salad on plate with a sprig of parsley on top and serve. Per serving: 196 calories, 4 gram carbohydrate, 167 milligrams cholesterol, 9 grams fat, 25 grams protein, 546 milligrams sodium. Including this dish into your recipes for high blood pressure is a must. And remember to select from the different mix of greens that are available for maximum nutrition and good health.